Fig 3 from Hung & Hakim, AJKD. Sudden cardiac death accounts for 25% of deaths in end-stage renal disease (ESRD) patients. Despite recent improvements, the rate is dramatically higher than the general population. Studies have indicated that the greatest incidence of sudden cardiac death is in the first dialysis treatment of the week after the long interdialytic interval, with the highest rate in the 12 hours pre- and postdialysis. The hemodialysis procedure remains a potentially modifiable factor, as studies have shown that rapid fluid and electrolyte shifts and changing drug levels may be arrhythmogenic. 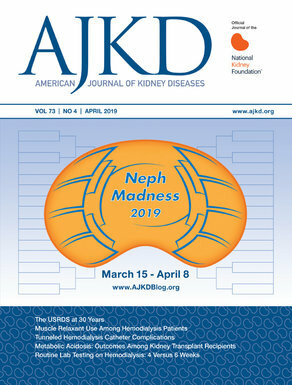 In a recent review in AJKD, Hung and Hakim review dialysate and serum potassium in hemodialysis. The following questions based on the article will test your knowledge on this topic. Post prepared by Dr. Rimda Wanchoo, Assistant Professor of Medicine, Hofstra NSLIJ School of Medicine. For a PDF version of the questions & answers, please click here. 1. All-cause and cardiovascular mortality begins to increase with which of the following ultrafiltration rates? Correct! Myocardial blood flow decreases during the course of dialysis and is partially restored towards the end of the treatment (Hung and Hakim, AJKD). These changes are exacerbated by larger and faster fluid removal, such that rapid fluid removal leads to repetitive subclinical ischemic injury to the myocardium. This decrease in the blood flow can be detected using an echocardiogram as reversible wall motion abnormalities (myocardial stunning). The risk of the wall motion abnormalities increases with higher ultrafiltration targets. Using cubic spline interpolation, data from the HEMO study showed that ultrafiltration rates over 10 ml/kg/hr were associated with increased risks of all-cause and cardiovascular mortality. 2. Which of the following statements regarding digoxin use in dialysis patients with heart failure or atrial fibrillations is true? Correct! Digoxin is commonly used in dialysis patients with heart failure and/or atrial fibrillation. However, caution is advised while prescribing this medicine. In a retrospective study by Chan et al, digoxin use in incident dialysis patients was associated with increased mortality, especially in patients with pre-dialysis potassium levels less than 4.3 mEq/l. Both potassium and digoxin compete for the Na+ /K+ -ATPase on the cardiac myocytes, causing hyperkalemia to decrease the effectiveness of the drug and hypokalemia to potentiate its toxicity. 3. A 45-year-old man with ESRD secondary to DM comes to the emergency room on Wednesday evening with complaints of weakness and shortness of breath. His regular dialysis days are Tuesday, Thursday, and Saturday. He missed his regular treatment on Tuesday as he was out of town attending his best friend’s wedding. Blood work done in the ER reveals a potassium of 7 mEq/L, and you decide to urgently dialyze him. What is the safest potassium bath for this treatment? Correct! According to Hung and Hakim, studies have shown that low dialysate potassium is associated with increased risk of cardiac death. The study by Karnik et al showed that patients dialyzed against a 0K or a 1K bath were more likely to suffer from a cardiac arrest. Another study by Pun et al showed that the risk of sudden cardiac arrest was higher for a low potassium dialysate (<2 mEq/L) when compared to a higher potassium dialysate (>2 mEg/L), regardless of the serum predialysis potassium. While both answers A and D are correct, Hung and Hakim prefer potassium profiling to reduce the arrythmogenic potential of dialysis treatment. The goal is to maintain a constant serum/dialysate potassium gradient to provide a moderate rate of decline of serum potassium concentration. 4. The plasma potassium concentration can be most dramatically reduced with which of the following dialysate bicarbonate concentrations? Correct! As explained by Hung and Hakim, a higher bicarbonate bath is associated with enhanced cellular potassium uptake due to bicarbonate-induced activity of the Na+/K+-ATPase. This causes a rapid drop in serum potassium concentration. In a study by Heguilen et al, eight stable dialysis patients were randomized to the 3 bicarbonate dialysate concentrations mentioned. Patients randomized to the highest bicarbonate concentration had the lowest serum potassium concentration, while the total potassium removed during the session did not differ between the groups. This suggests that the lowering of the potassium was due to shifting of the potassium from the extracellular to the intracellular compartment, rather than removal by dialysis.